Maori lived in South Westland many hundreds of years before European settlers arrived. They lived mostly along the coast in places where food gathering was good but travelled up and down the coast searching the mountains for pounamu (jade or greenstone). They named the Franz Josef Glacier – Kā Roimata o Hine Hukatere (the tears of Hinehukatere) and Fox Glacier – Te Moeka o Tuawe (the bed of Tuawe). In Maori legend Tuawe was a warrior who fell to his death while climbing with his lover Hine Hukatere. The Fox Glacier valley was his final resting place, and her tears of sorrow froze and became the Franz glacier in everlasting memory of her beloved. After Europeans arrived Maori were guides valued for their local knowledge. Dutch explorer Abel Tasman encountered Westland in 1642 but it was not until 1859 that any ship’s log recorded sight of the great glaciers. In 1857 Maori guides led the first Europeans, Leonard Harper and Edwin Fox to the area. Harper then named the two glaciers—‘Victoria’ (now Franz Josef) and ‘Albert’ (now Fox Glacier), after the Queen of the United Kingdom of Great Britain and Ireland. But Harper did not register these names. In 1865 German geologist/explorer/museum founder Julius Von Haast decided to name the glacier after the Emperor of the Austro-Hungarian Empire, Franz Josef I. The local village later took its name from the glacier. Haast also registered the name Fox Glacier, in honour of Sir William Fox, the New Zealand Premier. 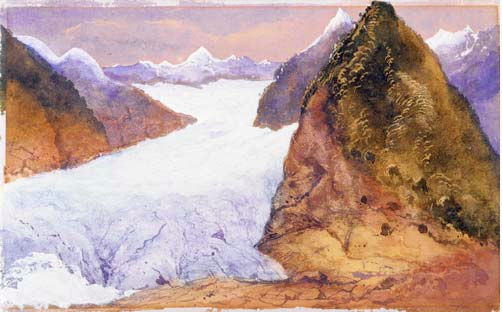 Sir William Fox visited in 1872 and painted a famous watercolour of ‘his’ glacier.